Keifer and Shawna Thompson – together known as Thompson Square – originally shot to fame with their 2010 single, Are You Gonna Kiss Me Or Not. The track topped the Billboard Hot Country charts and eventually went double platinum. Since then the husband-and-wife duo have racked up a further four top 20 hits, including Country Airplay number one If I Didn’t Have You. After a few years away, during which they became parents to son Rigney Cooper, they returned in 2018 with their independently released album, Masterpiece. I spoke to Keifer and Shawna recently to talk about the record, how they approach songwriting, their foray into children’s books, and plans for the rest of the year. Your album Masterpiece came out towards the end of last year – can you tell us more about it? Keifer: Well, Masterpiece is our first independent record. It’s been, what, eight, nine years? This is a project we got to do everything we wanted to do on. We wrote the songs we wanted to sing, produced, we used the producers we wanted to use. It really came down to every inch of it was about us and all of our decisions. Which is nice, to actually be an artist again and do everything that we’re supposed to do, and have our hands in every part of it. But this record is really about the last five years of our lives. Some of the best things and some of the worst things that have happened to us are on this record, and everything in between. There’s a lot of fun on the record as well. The title track is a song I wrote about our son Cooper, who’s three years old now, and actually when that song came about we actually changed the name of the album. Shawna loved the song so much we went back into the studio and recorded it at the eleventh hour. It really capped off the record nicely. Were there any songs on the album that were particularly easy or particularly difficult to write? Keifer: Well, those are relative terms. Shawna: Emotionally, Breakers was probably the hardest one to write. That song is just super-personal and I think a lot of people can relate to it at some point or another in your life. In my case it happened to be someone who it wasn’t supposed to, someone in my family. So that one was really, really difficult to write, emotionally. Keifer: Yeah, I don’t think a song is hard or easy to write. I just think it comes naturally or it doesn’t. If it’s hard to write, we don’t write it. And you keep writing until it feels right. Shawna: The path of least resistance. Keifer: Yeah, like Masterpiece, I wrote that song in about an hour. Everything I Shouldn’t Be Thinking About was written in about 20 minutes. So some of them are easy, some of them take time – I don’t think they’re harder or easier. Some of them come out a little bit faster but I don’t know if I’d say hard or easy. I think if it’s too hard then it’s probably wrong, for the most part. But all the songs on this record were relatively quick, and I think it’s because there’s so much truth to them. I think when you write about something that you know, that for me is a lot easier process than trying to make something up that you don’t necessarily personally relate to or you’re just completely making something up for the sake of doing it. When it’s coming from an emotional standpoint I think it’s much easier to process. How has your approach to songwriting changed between this album and the last one? Keifer: Yeah, I think the process is the same. You look at a chunk of your life and draw from those experiences. So that part for us has remained the same. I think the biggest difference between this one and the other two is Cooper, our son. He’s really added a lot of inspirational influence to us personally, which I think kind of poured out into the album. As a songwriter you’re always looking for inspiration, and becoming parents was a huge one for us. You’ve got a very diverse mix of styles on this album. Was that something that was important to you to explore when you were making it? Shawna: No, we didn’t even think about it. We just loved the songs, and we didn’t really want to put ourselves into a box. We really do love all kinds of music, but our heart is country. That’s what I grew up listening to, that’s what I grew up loving, and that’s the music that I make today. But we love everything from reggae to rock to Bruce Springsteen. I could go on and on, the genres are endless. But we just love good music. Keifer: What was funny is that after we got all of these different songs together, we listened to the record as a whole and somehow it all works. That was the really beautiful part about the whole thing. You also recently branched out into writing children’s books – how did that come about? Keifer: Well, I think as a writer, I’d never thought about writing a kid’s book or anything like that. I was dressing Cooper one morning when he was about nine months old, and putting his socks on I was singing this little song. I was making it up, and Shawna goes, “oh, is that something your mom used to sing to you?” and I was like, “no, I just made it up”. She said, “you really need to go downstairs and finish that, because I really, really like that”. I went down and finished it and played it for her, and then we played it to our management company, and they were like, “man, we love this, you should make this a book”. So it started as a song and it ended up as a book. That just kind of happened organically too. We’ve just been kind of letting freedom reign on the creative process. Cooper loves the song. Every time he gets dressed he starts singing it, which I thought was really cute. But it’s kind of fun to sing the right songs. Your main concern is to make a three-year-old smile, and it’s quite different than worrying about radio and charts and awards and the business part of it. So as Shawna says the album was very organic, and that was another huge organic thing that happened. We really enjoyed the whole process. There’ll be more to come too. It was a lot of fun to do. You’ve mentioned this is your first independent record. What have been the best and most challenging parts of that for you? Keifer: I think the most difficult part was writing the check for all of it. [Shawna laughs] It’s a lot more expensive when you’re paying all the bills. Shawna: But the best part has been doing everything we wanted to do with the songwriting and producers. Just doing what we want to do. This record is 100% Thompson Square. You won’t find anything else that’s more real and more Thompson Square. Keifer: We got the chance to be true artists again. We not only wrote nine of the 11 songs but we produced three or four. The other producers we chose, we handpicked those guys, because we thought they would add a lot to the record which they did, an incredible amount. And down to the artwork, who the photographer was, everything about it. We got to do all of it and it was really nice to have complete control. Would you like to do more production in the future – either for yourselves or for other artists? Keifer: We’ve been producing for years, whether on demos or even on our records. Our names went on the first two records as producers. We co-produced both of those records. We do it all the time. When you write and you arrange the song you’re producing the record. And then you’re going in there and you’re like an executive producer too, in addition to just a regular producer, because you’re the one that has final say-so on everything. So we’ve been involved in that process for 20 years now and obviously have gotten better and better at it the more you do it. I love the process. I think it’s fun to be able to take something that’s a guitar and vocal and that you have a picture in your head of what the song’s gonna end up sounding like, and you give it to an amazing musician who can bring your vision to life. Because I can’t play that good. You’ve been together as a duo for over ten years. What would you say the secret is behind your longevity in this industry? Keifer: Well, the only thing I can really say with us being married for this long and our career, I think they are synonymous because there isn’t really anybody else that does what we do how we do it. We started out as a married couple duo and there hasn’t really been anything like that. And there’s a reason why. It’s very difficult to partner with someone you can sing with and it sounds great sonically, but also that you can coexist on the road. I think in 20-something years we’ve been apart maybe two weeks. And Shawna and I are really great friends and we’ve had the same dream. In the beginning we were individual artists and it was really nice to see each other’s dream come true and be able to do what we love to do and still do it together at a high level. Shawna: I think it helps that we keep each other motivated as well. What have you learnt over the years from touring and being on the road? Keifer: I think appreciation is a huge thing. When you go out and you see people that have paid money to come and see you, no matter if it’s 10 people or 10,000, it just makes you realise that you maybe did something right. All the work that you’ve done in your music and putting these things together, writing the songs, all the years of dedication to the craft and the process, have paid off and people now are coming to see you. They’re standing in line to get signatures and buy merchandise. It’s such an amazing compliment to us and we never really take that for granted. It’s really special to us to do that, and we know how lucky we are to be able to do what we love to do for a living. You recently filmed the music video for Masterpiece. Can you tell us more about that? Shawna: Yeah, Keifer can probably talk a little more about this but we actually went to his home town of Miami, Oklahoma. There’s a beautiful old theatre there that we played at before. It was built in the 1920s, I think, and it’s just super-pretty. We always thought it’d be really cool to film there, and we did. We also had some locals there who made some cameos, and Cooper’s making a cameo in there as well as Keifer’s dad. So we’re super-excited about it. Keifer: The coolest part about the video, I think, is that my dad back in the day would video a lot, but it was all with an 8mm camera. So there’s no sound or anything, it’s really old-school, but that’s all there was back then. So I went back and got all the footage from 1973 until he stopped videoing, had all that converted, and there’s a lot of old 70s and 80s 8mm footage in the video. It looks absolutely incredible. What’s the one song that you wish you’d written? Keifer: You know, I’m a sucker for ballads. I think probably In My Life. It’s probably one of my favourite songs ever. There’s so many though. It’s really hard. And then just basically Springsteen’s entire catalogue. But if I had to pick one song, that’s probably the one that pops out right now. Shawna: I’m still thinking! That’s a tough one. It really is. What does the rest of this year look like for? Keifer: Well, a lot of touring. A lot of really big announcements. I can’t really say. Life’s just changed a lot and we’re getting really close to doing something really special, so we’ll be talking about that very soon. But a lot of touring, and Masterpiece being the new song. And then really the coolest thing is we’re going to come over and tour in the UK and different parts of Europe this fall. That’s something we’ve wanted to do for a long, long time. Shawna: We’ve been waiting to do that for years, to come over and see you guys. We’re so excited. 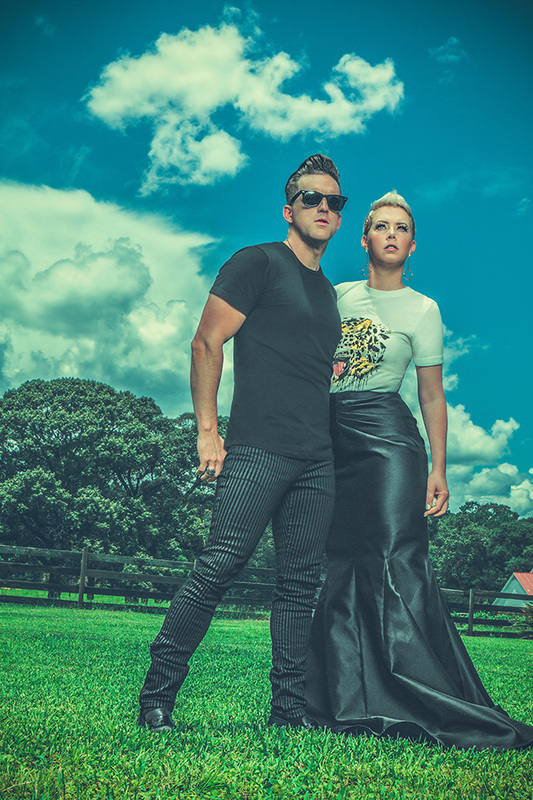 Thompson Square’s latest album, Masterpiece, is out now.